Kung Fu Thai & Chinese Restaurant ushers in the Lunar New Year with a traditional Lion Dance. The Lunar New Year, known throughout the world as Chinese New Year will start on the 8th of February, in Asia. 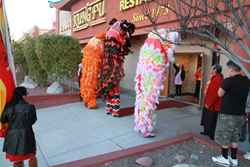 At the same time, on February 7th, in Las Vegas, one of the first Chinese Restaurants to open (Kung Fu Thai & Chinese Restaurant "1973") will be ringing in the the Year of the Monkey, with the Lohan School of Shaolin, performing the traditional Chinese Lion Dance. Allan Wong, general manger of Kung Fu Thai & Chinese Restaurant, is once again honored to maintain a longstanding Chinese New Year in Las Vegas tradition, in presenting its patrons with a live Lion ceremonial dance performance conducted by Lohan. The legendary dance will be performed on Sunday February 7, 2016 at approximately 12:45 pm, starting in front of the Asian restaurant located at; 3505 S Valley View Blvd, on the Southwest corner of Spring Mountain Road. At this annual event, patrons, guest, and the public are welcomed to watch the almost half an hour of presentation, where patrons will be given upon request, the traditional Chinese Red envelopes for their children to give to the Lion. The lion dance will be performed by specially trained students at the Lohan School of Shaolin, the foremost martial arts experts of Chinese Kung Fu in Las Vegas. Their ceremonial dance has become a tradition every Chinese New Year, in and around major resorts, and businesses in Las Vegas. It is only befitting that they should start off one of their first dance of the New Lunar Year at the first Chinese & Thai Restaurant in Las Vegas. The Lunar New Year, which last for up to 15 days, starts with the first day in the new Lunar calendar. The Calendar is based off of astrological events-how the movement and positions of celestial objects-stars and planets align with one another. This is why the New Year shifts from one day to another, every year or cycle, which usually falls between mid January through the middle of February. Last Years Chinese New Year started on February 19. Kung Fu Thai & Chinese Restaurant first opened in downtown Las Vegas, on 3rd Street and Fremont in 1973. The eatery is open from 11:00am to 10:30pm for Lunch and Dinner every day of the year. The Kitchen offers every menu item for takeout, along with a full time in house food delivery in Las Vegas staff, sending meal delivery throughout the Vegas valley, up to a 5 mile radius. This Asian restaurant will even cater any special event. In addition a full time bar along with Beer Wines and Cocktails are available for our patron’s convenience enhancing their Asian dining experience in Las Vegas.